Thanks to our amazing parents and energetic eighth graders, including Eva, Colin, Jade, and Sophia, the book fair is open, stocked, and ready for previews and next weeks big sales. Don't forget to check out all the books and educational resources. Graduate L. Simpson on Track to Bring Home Another State Championship in Basketball! On Saturday, January 5, 2018, our very own L. Simpson (Class of 2015) took the floor with his teammates at Sierra Canyon High School as the reigning state basketball champions in the open division. Some former teachers of his from Chapel decided to surprise L. at his game. 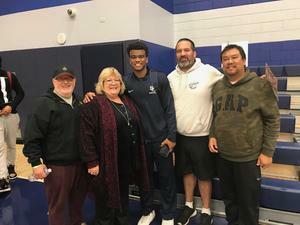 It was a night to remember with Sierra Canyon dominationg the game and earning the team its second win in as many days. L. was all heart and energy. We thank him for hittting a 3-pointer right in front of his loyal Chapel fans. Good luck, L.! 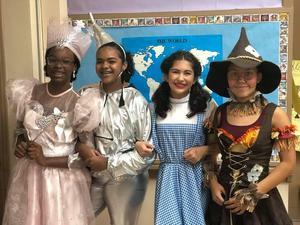 Which Wicked 8th Graders Went for a Theme? What do you do if it's Halloween, your last Halloween with your Chapel classmates, and you want to do something memorable? Well you could do what Jade, Maya, Sophia, and Eva did-find a theme that symbolized both friendship and the path they traveled together. 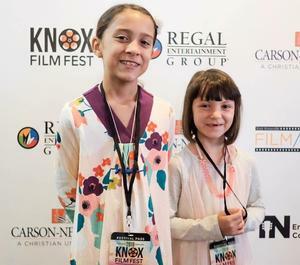 Then there's the way Brianna and Alyssa celebrated....sticking on mustaches and showing off their muscles with Mr. D.
Eva Coleman plans to walk in the Rose Bowl 5K for the cure of Childhood Diabetes. This year she set a goal for herself of raising $1,000. With still a week to go, she's exceeded her goal by nearly $400. Student Council Positions Set for the 2018-2019 School Year!